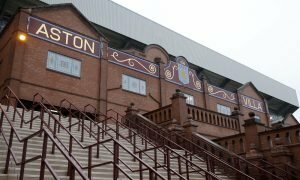 Villa hope to sign Manchester City striker on loan | The Transfer Tavern | Where football transfer rumours fly or die! A rumour concerning Aston Villa and Manchester City has reached us here in the Football Transfer Tavern, with John Percy of The Telegraph reckoning that Paul Lambert will attempt to sign Swedish international striker John Guidetti this January transfer window. The striker is current fifth choice at Manchester City under Roberto Mancini, although he has missed the majority of the season with a virus that left him with paralysis in his right leg. Guidetti is highly rated by Roberto Mancini, conveyed by the fact he signed a five year contract in October. Paul Lambert is desperate to add some more attacking options to his Villa side, and reckons a loan move until the end of the season would suit both parties. Former Villains manager Martin O’Neill is expected to provide the main competition, with it thought that Sunderland are also keen on making a similar bid for the Swede. Lambert sent scouts to watch Guidetti play during his loan spell for Feyenoord last season, where the youngster scored a superb 20 goals in 23 appearances for the Eredivisie club. Villa fans – would you like to see Guidetti make the switch to Villa Park? Can you see him being a good signing? Vote in our polls below.